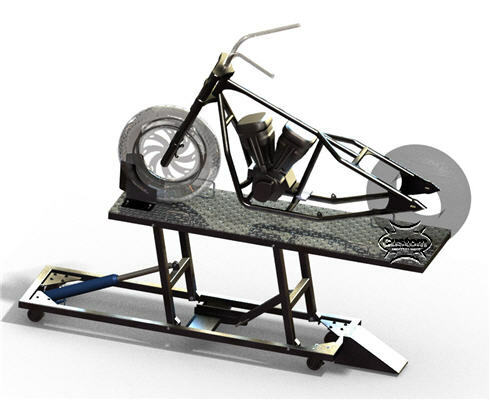 New One-Of-A-Kind - Motorcycle Lift Table Plans! Now you can build your own handy motorcycle lift for motorcycle maintenance and custom motorcycle work. We know you are going to enjoy these motorcycle lift plans. And you are going to love the end result as well...a hydraulic motorcycle lift that will help you for the rest of your life! The plans are for a hydraulic motorcycle lift. The operator will pump the lever in order to raise the platform. It's pretty simple and straight forward. 4 pages 36" x 72" (highly recommended). They are designed using the most sophisticated software available. Our senior design engineer put his sweat and tears into this painstaking design and all it's elements, taking into consideration the demands of the home mechanic AND the busy professional. Max lift height of 36". Minimum height of platform at lowest level is 9". 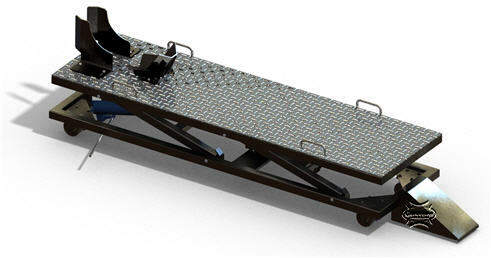 The Motorcycle Lift Table is 24" wide by 84" long. Weight limit on the lift is 1100 lbs*! Hydraulic jack available from Harbor Freight and is relatively cheap. Caster wheels have locks to keep from moving. Spring pin design allows easy locking of lift when working on bike. Stoppers keep the lift from going beyond height capacity. Choke is adjustable for various size wheels. Handles on the sides for rolling and also for tying down the bike. Variable height adjustment safety lock. Robust base and sturdy ramp design. 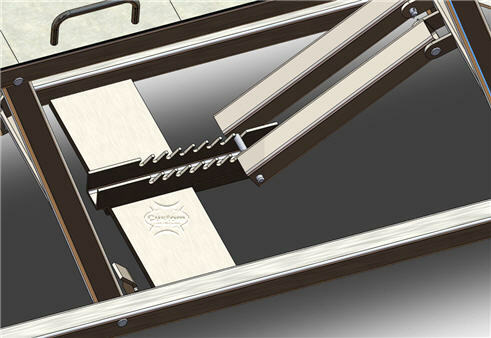 The final result will be your very own manual lift table that is very simple to operate. And you'll find that it will be quite simple to build as well. 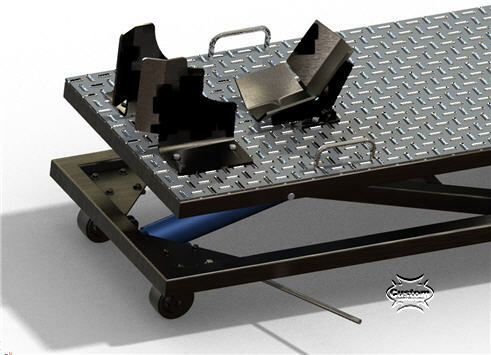 These motorcycle table lift blue prints have all the measurements and angles you need to make it simple for you to build. As with all of our plans, the best feature of our plans is that we provide you with different angle views which makes them much easier to follow, and therefore build. 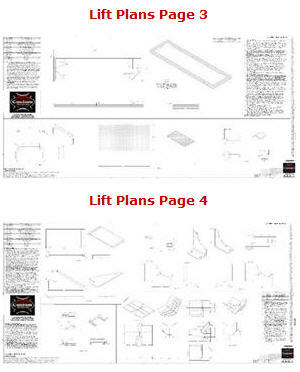 The price for 4 pages of detailed motorcycle lift table plans is just $99 $49.95. 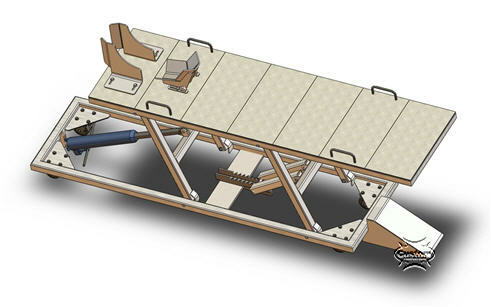 Here Are The Fine Details and Features That Set This Hydraulic Motorcycle Lift From All The Others! We ran FEA on the weakest link which is the safety bar that should hold the platform in the event of a hydraulic cylinder failure. It held 1100 lbs (500 kg) with minimal deformation. Although this lift can hold a lot more weight, we would rather have a safety factor instead of pushing it to it's limits. The limit on the lift is 1100 lbs. These plans are 4 pages and they are 36" x 72"! ...And the detail, measurements, and materials list is like no other set of blue prints. You get angles and views that nobody in the market has, making it easier to understand and build. 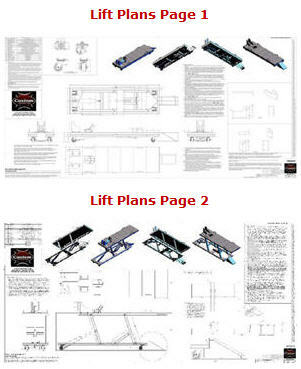 We are confident that we created the best motorcycle lift plans on the market. Light Duty Motorcycle Lift Build! A Cheaper and Stronger Lift!